Dr. Peter H. Bouman was raised in Rochester, New York. He graduated Phi Beta Kappa from Carleton College in Northfield, MN, in 1990 with a degree in philosophy. He went on to serve four years as an officer in the United States Marine Corps. During this period, he participated in Operation Restore Hope, Somalia. 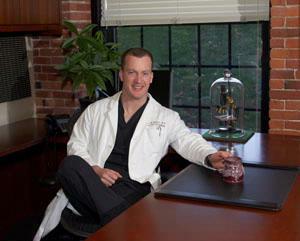 After his discharge from the Marine Corps in 1995, Dr. Bouman went on to medical school at the University of Rochester in Rochester, New York, graduating with honors in 2001. He completed his residency at the University of Miami in 2005. Dr. Bouman is a diplomate of the American Board of Dermatology, a Fellow of the American Academy of Dermatology, a Member of the American Society of Dermatologic Surgery, and a member of Alpha Omega Alpha (medical honor society). Dr. Bouman also serves as a part-time clinical instructor at the Central Maine Medical Center Family Practice Residency Program. He lives in Freeport with Dr. Burns and their two daughters.